In cases of suspicious death, investigators and police bring in a medical examiner to help search for clues as to how the person died and ultimately identify the killer. Medical examiners also work outside of suspicious deaths and murder cases, examining remains of people who died of natural or accidental causes. Medical examiners hold medical degrees and receive their positions by appointment, whereas coroners do not have to have medical degrees and act as elected officials. According to Dr. Clark’s testimony, he did not come into contact with the victims’ bodies until the next day (morning). Therefore, it is Dr. Clark’s testimony that he could not give an approximate time of death—only that the victims had been deceased within 24 hours of him coming in contact with the bodies. HOW DOES DR. ANTHONY J. CLARK’S TESTIMONY HELP LAW ENFORCEMENT AS THEY SET OUT TO ESTABLISH A TIMELINE OF EVENTS LEADING UP TO THE VICTIMS DEATHS? The murder investigation of seventeen-year-old Sterling Conner Jr. and his 20-year-old sister Laqecia Herring was a sham. Instead of law enforcement officers, both defense and prosecuting attorneys, judges and the medical examiner’s office utilizing their professional experience to ensure justice is carried out properly, they dummied themselves down to cover up several dumb actions that they seemingly have become so accustomed to that the person that was charged with the murders, 17-year-old DeShon Thomas, filed Pro Se because for nearly three years of him sitting in the Leon County Jail none of the four different court appointed attorneys would do the least to build a legal defense—no depositions—nothing. It’s too bad that most of those who are sworn to protect DeShon’s Constitutional Rights were more interested in their own pathetic agendas within their network—the State Attorneys Office refused to allow the victims autopsy reports to be released–and defense counsel refused DeShon’s mother’s offer to hire a private investigator to assist on DeShon’s case—then refused to retain professionals to refute Dr. Clark’s testimony. Dr. Clark’s testimony is either him dummying himself down—far, far away from his M.I.T. background or him failing to recognize how far science—the study of pathology and everything else about forensic pathology—has advanced. All factors combined is another reason to show that what Tallahassee currently has in place may not be ready for 21st Century Policing. TALLAHASSEE ATTORNEYS—SPINELESS OR CAUGHT IN BETWEEN A ROCK AND A HARD SPOT? Tallahassee, FL–ARE ATTORNEYS WITH THE PUBLIC DEFENDER’S OFFICE, ATTORNEYS WITH REGIONAL COUNSEL’S OFFICE WHO ARE COURT APPOINTED & SOME LOCAL PRIVATE ATTORNEYS– MUZZELED BY COUNTY & CIRCUIT JUDGES IN ORDER TO APPEASE STATE ATTORNEY WILLIE MEGGS’ OFFICE? Author MAUL10Posted on February 13, 2015 July 16, 2017 Leave a comment on TALLAHASSEE ATTORNEYS—SPINELESS OR CAUGHT IN BETWEEN A ROCK AND A HARD SPOT? Tallahassee, FL—When a lay person files a complaint with The Florida Bar against an attorney, it is the responsibility of The Florida Bar to ensure that the attorneys are abiding by their Professional Rules of Conduct. So why has The Florida Bar chosen to protect attorneys who molested a child? The Florida Bar is located in Tallahassee, Florida. In November 2014, the citizens in Tallahassee voted to end corruption in local government. However, if the local government agencies abided by their own rules and policies, one could say that the Anti-Corruption Amendment that the citizens voted to enact may have not passed. The majority of Tallahassee citizens have low morale when it comes to equal justice on all fronts. The “culture” in Tallahassee is that one and one’s whole family can easily become “blackballed” if they were to speak out against corruption. Case in point, former Department of Corrections Secretary Mike Crews, former Florida Department of Law Enforcement Officer Gerald Bailey, and former Leon County Sheriff’s Deputy of the Year David Graham (classic). On February 7, 2011, when seventeen-year-old DeShon Thomas, a former freshman at Tallahassee Community College, was charged with Two Counts of 1st Degree Murder and Possession of a Firearm by a Juvenile Delinquent, immediately the Public Defender’s Office withdrew. DeShon sat in the Leon County Jail for nearly a month without a court appointed attorney. In March 2011, DeShon and his mother signed a contract with a private Attorney Gregory Cummings. Mr. Cummings, who conducted himself like a used car sales man, or better yet, an ambulance chaser, called DeShon’s mother nearly every day, begging for her to hire him. DeShon’s mother did not hire Mr. Cummings right away, but like any mother who loves her child, needed legal help for her son. Yes, Mr. Cummings seemed to be shady from the start. Regardless, DeShon needed an attorney and DeShon’s mother believed that she had the protection of The Florida Bar if Mr. Cummings chose to practice unethically. The contract between Mr. Cummings, DeShon and DeShon’s mother stated a $35,000 retainer fee, in which neither DeShon nor his mother had or pretended to have at the time of signing the contract. However, Mr. Cummings accepted $11,000 and promised to start building a legal defense for DeShon—Mr. Cummings promised to have DeShon take a polygraph test. It would be DeShon’s mother’s responsibility to pay out of pocket for the test and to make monthly payments. Over Sixteen months there were four rescheduled Pretrials (all at the request of the State). DeShon’s mother had paid nearly $30,000 to Mr. Cummings. After DeShon fired Mr. Cummings, DeShon’s mother learned that Mr. Cummings had not filed a single document to build a legal defense for DeShon. Mr. Cummings did not place DeShon’s AT&T cell phone records in DeShon’s case file and the victims’ autopsy reports were kept out of public record by the State Attorney’s Office. Why? Because these are two main sources that could exonerate DeShon. The State Prosecutor on the case, who was Jack Campbell, highly depended on the testimony of DeShon’s co-worker/roommate to testify against DeShon. With the admission of DeShon’s AT&T cell phone records and the victims’ autopsy reports, Campbell’s case against DeShon would’ve been derailed. So, instead of facing the fact that the State of Florida was on the wrong trail of a cold-blooded murderer—they clearly chose to allow a cold-blooded murderer to remain in the community—putting Tallahassee citizens and all of the college students that live in Tallahassee during school session in great harm. 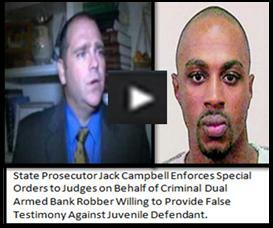 Jack Campbell, Eric Trombley, and Georgia Cappleman all work for State Attorney Willie Meggs. The Florida Bar received a complaint against them in regards to their dishonest, fraud and deceit in the role that they played in DeShon’s case. The Florida Bar decided that Gregory Cummings, Jack Campbell, Eric Trombley, and Georgia Cappleman had not violated any of their rules. It would be easy for those at The Florida Bar to believe that DeShon and his mother are just upset and want their money back. Any mature person knows that when money leaves your hands, you would be most happy receiving the services you paid for more so than having to start all over. Apparently, Mr. Cummings, Jack Campbell, and Circuit Judge James C. Hankinson had probably been running schemes involving defendants for quite a while. DeShon’s case process, according to other attorneys in Florida, was like none that they had ever seen. Four court appointed attorneys filing motions to withdraw, the public defenders clearly running away from it all—and absolutely nothing on the record after paying out nearly $30k…DeShon’s mother was not surprised when her innocent son was convicted. At trial, DeShon was represented by the Office of Criminal Conflict and Civil Regional District One Office, Assistant Regional Counsel Daren Shippy. DeShon’s trial was like an impromptu trail, according to DeShon’s case docket only two or three people were deposed—Dr. Anthony J. Clark, the medical examiner, Leslie Rabon, Leon County Sheriff Criminal Analyst. Yet, there were about 30 witnesses. Despite several items in the victims’ residence being out of place, there was no physical evidence against DeShon. The “culture” in Tallahassee—nothing seems to have to happen formally—nothing seems to have to happen according to policy, rule or law. How sad is that? Kids live and learn. Adults should know better. Any official of the court who chooses to molest a child in the name of justice—“Florida Justice”—is a disgrace to the State of Florida, the United States and the United States Constitution. These sick people should not be protected by any organization or agency. Clearly, the Florida Cabinet are not the only ones in Tallahassee who are spineless.